Lock in a great price for Costa Colonia - Riverside Boutique Hotel – rated 9 by recent guests! The room, including the bathroom, great shower. Very clean. Pleasant, helpful staff, knowledgeable of area. Loved the pools. Good food with reasonable prices. We really enjoyed the confort and the design of the room. Moreover, the location is great to go the beach and walk by the coast. Breakfast was good and varied, and the staff very nice! Attendant very very friendly and helpful. Big and comfortable suits. Good location nearest beach. Nice rooms and good location, right opposite the river and no too far from the city centre. Nice location. 30 min walk to the historic center. Very nice design hotel with super comfortable and spacious room. Swimming pool inside and outside were fine as well as the sauna. The breakfast was really complete. It feels great and comfortable to stay in this hotel. The rooms are very spacious and comfortable, the swimming pool is great and the food was extremely good. My father left his jacket in the wardrobe and the staff could not have been more helpful. They arranged for it to be sent to Montevideo which was so kind of them. They had been most kind and helpful during our stay but I felt they really went out of their way for us when this happened and we are extremely grateful to them for reuniting my father (aged 89!) with his jacket. Big room with kitchenette and comfortable bed. Good air con. such a nice hotel with a great architecture. helpful staff an located near the beach. Costa Colonia - Riverside Boutique Hotel This rating is a reflection of how the property compares to the industry standard when it comes to price, facilities and services available. It's based on a self-evaluation by the property. Use this rating to help choose your stay! 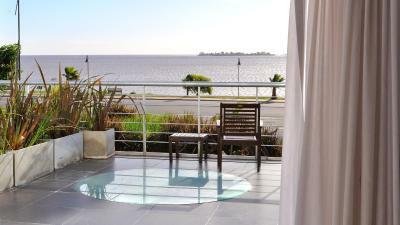 One of our top picks in Colonia del Sacramento.This latest contemporary hotel offers rooms overlooking the peaceful city of Colonia del Sacramento. Its complete leisure facilities include an outdoor pool, a wellness spa and free Wi-Fi. The spacious lofts and suites at Costa Colonia have tasteful cream and beige color themes. All have air conditioning, an LCD TV and DVD player and seating area. They also include private balconies. Guests at Costa Colonia can enjoy river views and a la carte dining at the open-air restaurant and bar. A breakfast buffet with croissants, juices and seasonal fruits is served daily. Costa Colonia has a great location, only 1.2 mi from the Lighthouse, Buque Bus Station and Radisson Casino. It is also 34 mi from Jorge Newbery Airport. Buenos Aires is 60 minutes away by ferry. Guests at Costa Colonia can make use of the car and bike rental services. Airport shuttles can be arranged. When would you like to stay at Costa Colonia - Riverside Boutique Hotel? This loft features a private bathroom, kitchenette, floor-to-ceiling windows and a terrace, as well as wooden furniture and beige color drapes. There is a LCD TV, DVD player, hairdryer and free Wi-Fi. Extra beds can not be accommodated. This loft features a private bathroom, kitchenette, floor-to-ceiling windows and a terrace with a splendid river view, as well as wooden furniture and beige color drapes. There is a LCD TV, DVD player, hairdryer and free Wi-Fi. Extra beds can not be accommodated. This is a spacious suite with a separate living room which allows an extra bed. It also has a comfortable bathrobe and slippers. This suite features a private bathroom, a kitchenette, floor-to-ceiling windows and a terrace with a splendid river view, as well as wood furniture and beige color drapes. There is a living with a sofa bed, an LCD TV, a DVD player, a microwave, a hairdryer and free Wi-Fi. This suite features a private bathroom, kitchenette, and a double balcony with a splendid river view, as well as wooden furniture and beige color drapes. There is a LCD TV, DVD player, microwave, hairdryer and free Wi-Fi. Extra beds can not be accommodated. 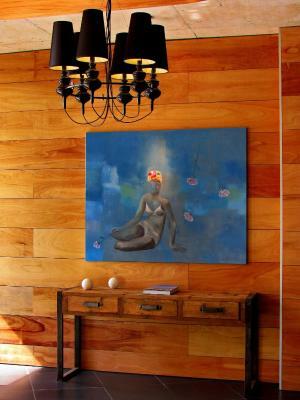 House Rules Costa Colonia - Riverside Boutique Hotel takes special requests – add in the next step! All older children or adults are charged USD 50 per person per night for extra beds. Costa Colonia - Riverside Boutique Hotel accepts these cards and reserves the right to temporarily hold an amount prior to arrival. Please note that property doesn't accept pets, except companion animal. This pet must be correctly certificate as one. Please note that additional beds are only permitted in the suite. The breakfast was not good enough. The shower was silly. The blinders were not covering all the window. The hotel was nice and clean. Black our drapes didn’t cover whole window and not enough deck space in bathroom. A bit remote. About a 2 mile walk to town. Nice comfortable room. Quiet and peaceful. the breakfast-room is a little bit to small. notice, it's near by the beach but not in the city-center. The bedroom was very clean and a really good size. These have a balcony, with a fantastic view. The breakfast was very good too and the vibe is very relaxing, it exceeded my expectations. It was really great Hotel und the room was stylisch. Room is big und you can walk in 20 minutes in the town. Near the beach. Was really quite room. The Hot Tub in the spa was not hot, but warm. The jets were almost useless. It was a great tub to exercise in though! It was big. Had to contsct front desk to get the sauna working. Had some good exercise equipment in the spa. Very clean room, with helpful staff. The food in the restaurant was excellent, everything we tried was delicious. We ate in some other places in old town but they fell far behind the restaurant in the hotel. Pool was nice, and spa room was good. The gym is small and the fitness equipment did not work properly. Nice hotel close to beach. The city center of Colonia is on walking distance. The hotel has a small but nice pool area. I can recommend this hotel. Great place to stay! Wonderful location and - if you have the right room - excellent sea view Very good breakfast!